This MP3 file is from the album Jamaican rumba : music by Arthur Benjamin. Vol. 1 / Ian Munro, piano. Duration: 14 mins, 11 sec. Recorded/performed at: Newcastle Conservatorium Concert Hall, Stuart & Sons piano, on 1996. 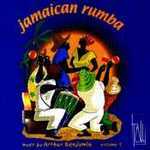 CD: Jamaican rumba : music by Arthur Benjamin. Vol. 1 / Ian Munro, piano.